Ten years ago, at the beginning of the smartphone revolution, app building and subsequent distribution were entirely managed by developers. Then came the mobile app marketing era, which in retrospect, has grown phenomenally over the past couple of years. But, can it possibly grow any further? Or have we already hit the saturation point? In the year 2015, mobile app marketing drove the entire app industry to a whopping $69.7 billion in gross revenue. 1 year later, and the figure had risen to $88.3 billion. According to Statista, exponential growth in the number of people using smartphones, strategic app developments by more businesses, plus progressive adoption of smart marketing strategies will see the mobile app industry hit $188.9 billion in revenue by the year 2020. Now that everyone you know has a smartphone or two, it may seem that the only growth in smartphone usage in the future will only be about upgrading to better gadgets. Well, surprisingly, worldwide smartphone penetration currently stands at 44%, up from 39% in 2016. Even by 2022, when we assume that we’ll probably be riding around in autonomous vehicles, the number of smartphone users will still be shy of 60%. And then there’s the issue of businesses that are developing apps. According to Forrester, there is still a huge gap between organizations that consider apps as a transformational catalyst, and companies that think of apps as just another development channel. By 2016, only 18% of surveyed businesses fit the former description, and it was projected to increase to 25% in 2017. Evidently, the number of consumers and their corresponding needs are evolving way more rapidly than businesses. Customers continue to expect mobile apps to be the chief touchpoints between their favorite brands and them. And that’s precisely where mobile app marketing comes in. It fills this crucial gap to align apps to consumer needs, and subsequently drive the distribution of mobile apps to an already warm prospect base. Without it, businesses would be struggling to reach out to their target markets, and subsequently, provide the right solutions to their consumers’ needs. The mobile industry, as we’ve witnessed from recent trends, is very dynamic. Each new change is replicated across the board, including app marketing. Combine that with the current and project future growth of consumers and their corresponding businesses, and you’ll realize that mobile app marketing is just getting warmed up. It will continue evolving to adapt to the market and changing needs. The best way to strategically prepare yourself is understanding current mistakes, plus future expected trends. Of course, downloads are great. Because how else would you get users to use your app without downloading it in the first place? That, coupled with the fact that an increase in the number of downloads would boost your app’s ranking in the app store, has triggered a very common misconception. That the number of downloads is the ultimate measure of marketing success. A successful marketing campaign extends beyond organic visitors because there is a type of user that is way more valuable- a loyal user. That’s the type of user that translates a download into revenue. Interestingly, the number of downloads and subsequent revenue don’t always go hand and hand. Nothing demonstrates this better than a comparative table of app downloads and revenue on two of the leading app marketplaces- the App Store and Google Play Store. During the second quarter of 2016, Google Play Store recorded twice the number of app downloads as the App Store. But the tables do a drastic turn drastic when we come to the actual revenue generated. 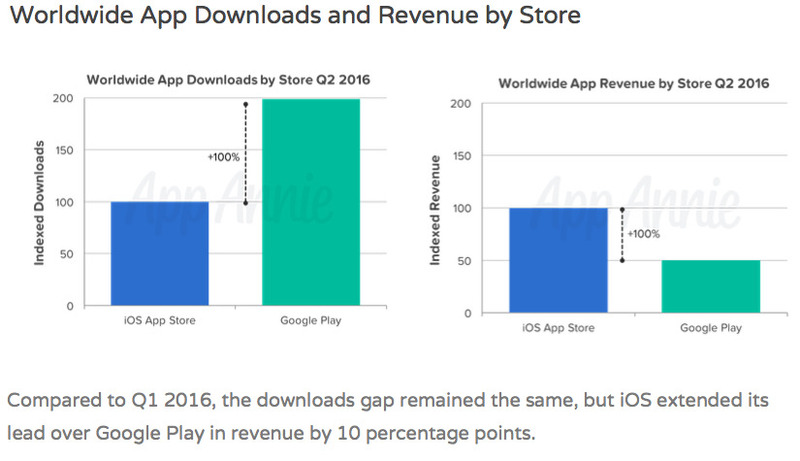 The App Store recorded twice as much revenue as Google Play Store. Evidently, apps on the App Store had utilized more strategic marketing that was heavily focused on ROI, as opposed to the number of downloads. Remember the last time you saw a billboard about an app, or perhaps a page on your favorite magazine, then you pulled out your phone to search for the app on the App Store? Let’s guess-you’ve never bothered to even look for the phone. So why do some marketers assume their target audience is any different? Many brands have been pushing their apps through traditional marketing methods like TV media, billboards, magazines, and newspapers. But understandably, they never generate substantial results. The target audience for app marketing is a much-uncomplicated lot. They are often on their phones. And when they are not, they don’t want to mine through the App Store for an app they’ve seen on Facebook for PC. The process should not be clunky and involving at all. Your app marketing services should focus on mobile-based platforms that avail apps at the touch of a link. Even the app press release should be primarily distributed through mobile-optimized sites and platforms like Facebook Mobile. The scenes are always shot during the daytime, when the sun is hot, by sweaty, seemingly thirsty actors. And Coke even throws in something extra- the popping sound. Enough to get your throat burning. Now try to apply that to mobile apps. Gone are the days when marketing the app itself with its features was enough. The target audience now wants to feel the experience of using your app before actually downloading it. As a matter of fact, 86% of customers are more likely to proceed and purchase when they are not overwhelmed by unnecessary, confusing info. Thankfully, the App Store now supports app demo videos, which should definitely be included in your app store optimization. Okay, we agree developers are the kings of mobile apps. They recognize pretty much everything in the technical world of mobile applications. And for some time now, many businesses have stretched their development teams to cover app store optimization. Despite the wealth of knowledge your development team has in mobile app languages, burdening them with marketing is a bad idea. Mobile app marketing is a totally different field, with a separate set of required skills. Prelaunch marketing and subsequent app post-launch marketing are so intricate that even digital marketers are just not cut out for the whole app tweaking and engagement process. The most strategic companies are increasingly leveraging seasoned app marketing agencies like PreApps. They have just the right expertise and experience to tactfully optimize mobile apps for the App Store, manage app usage analytics, and drive app reviews through media platforms. All of these strategies collectively achieve optimal app ranking and substantially boost revenue. Marketing has always attempted to reach out to the maximum possible target audience, through the easiest, most convenient strategies. For some time now, this has been the basis for hybrid app development. Hybrid apps are flexible enough to get you to the App Store and Google Play Store simultaneously, without redeveloping the entire app ecosystem. That’s one way to expose yourself to double the audience with one development package. Well, that’s good enough. Unfortunately, hybrid apps have a caveat that markers are increasingly finding it difficult to deal with. Going hybrid forces you to compromise on user experience. And that complicates the whole user retention process. Take a look at Facebook, for instance. It’s the world’s largest and most established social media site. But its mobile apps are still laden with serious bugs because they chose hybrid over native. The future of mobile app marketing lies with native apps. Marketers will continue pushing their clients to shun hybrid, and go for native. Although they can only be rolled out on one platform, native apps are cleaner, with fewer bugs and much superior user interface. Retaining users, therefore, becomes simpler- translating to higher ROI. Monetization has always been the core focus of mobile apps. Without a solid and clever monetization plan, your app is only as good as a wasted income opportunity. Marketers have been leveraging direct sales, freemium, subscription, and in-app purchases as the primary monetization models. Direct sales require users to pay before downloading; freemium only grants access to limited features for free, and unlocks the rest after payment; subscription is periodically renewable; while in-app purchases involve charging a fee for selected items in the course of using an app. While these models have continued generating revenue, they have setbacks that have discouraged loyal users. Additionally, coping with changing user needs is becoming particularly challenging, since people progressively shun apps as soon as they are requested to make a payment. The best option for marketers, therefore, is developing creative models that respond to evolving user preferences, while protecting app revenue streams at the same time. Crowdfunding and sponsorship are two examples that were recently introduced and are expected to surpass some of the traditional models in the near future. Crowdfunding relies on donations from willing users; while sponsorship requests users to act as advertising sponsors at a fee, where part of the money paid by advertisers is credited to the developers and the rest goes to user accounts. Celebrity endorsement, although expensive, was a relatively effective marketing strategy a couple of years back. Lately, however, we are seeing the emergence of popular social media personalities who are often criticized as “famous for nothing”. Whether they deserve the fame is a debate for another time. What is certain, however, is that they continue to be exceptionally effectual influencers. Often way more influential than celebrities. While only 3% of consumers can be influenced by celebrity endorsements, 70% of millennials are influenced by recommendations from their peers. Combine that with the fact that 30% of consumers are more likely to purchase products recommended by non-celebrity influencers, and you have yourself a super marketing tool. 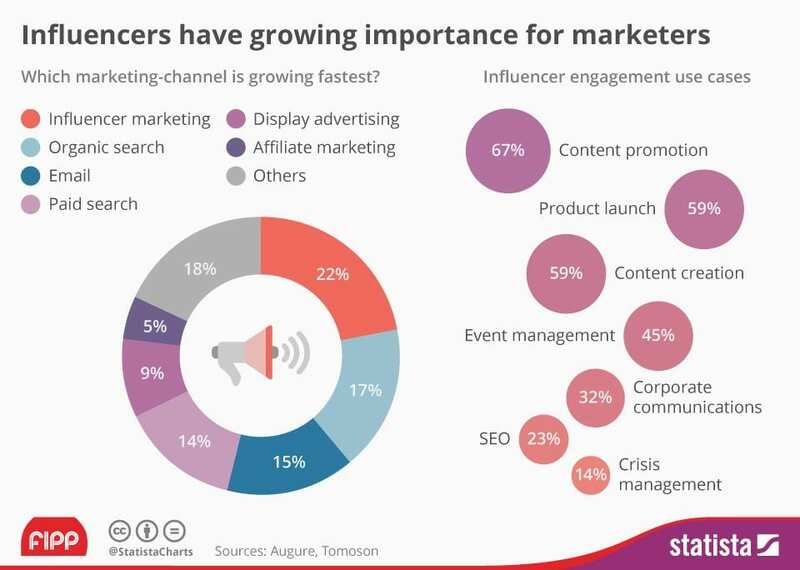 As a result, influencer marketing has become the fastest growing marketing strategy, and mobile app marketers are now joining the bandwagon. As more mobile app marketers continue adopting it, this strategy could soon surpass paid social media marketing- which is exceedingly being affected by the prevalence of ad blockers. In 2016 alone, the use of ad blockers had grown by 30% and the numbers are still rising. Going by expert analysis, global app downloads are expected to hit 284 billion in 2020, then 352 billion in 2021. In addition to increased smartphone use, this growth will be driven by emerging markets and rapid population growth. Thanks to exponential population growth, countries like India and China will join the league of top mobile economies. India, for example, will contribute at least 20 billion downloads by 2020, making it the 4th largest mobile economy behind China, U.S., and Brazil. To capitalize on this, mobile app marketers will prioritize geo-optimization of their apps on these four areas, before concentrating on other emerging markets. If you want to beat your competition by a long margin in future, you’ve got to start looking into the possibility of developing Indian and Chinese versions of your app. In the year 2015, mobile app marketing drove the entire app industry to $69.7 billion in gross revenue. 1 year later, and the figure had risen to $88.3 billion. Exponential growth in the number of people using smartphones, strategic app developments by more businesses, plus progressive adoption of smart marketing strategies will see the mobile app industry hit $188.9 billion in revenue by the year 2020. Smartphone penetration currently stands at 44%, up from 39% in 2016. Even by 2022, smartphone users will still be shy of 60%. A successful marketing campaign extends beyond organic visitors because there is a type of user that is way more valuable- a loyal user. Your app marketing services should focus on mobile-based platforms that avail apps at the touch of a link. Gone are the days when marketing the app itself with its features was enough. The target audience now wants to feel the experience of using your app before actually downloading it. Despite the wealth of knowledge your development team has in mobile app languages, burdening them with marketing is a bad idea. Unfortunately, hybrid apps have a caveat that markers are increasingly finding it difficult to deal with. Going hybrid forces you to compromise on user experience. And that complicates the whole user retention process. Marketers have been leveraging direct sales, freemium, subscription, and in-app purchases as the primary monetization models. Marketers are developing creative models that respond to evolving user preferences while protecting app revenue streams at the same time. Influencer marketing has become the fastest growing marketing strategy, and mobile app marketers are now joining the bandwagon. To capitalize on rapid population growth, mobile app marketers will prioritize geo-optimization of their apps on the four leading mobile economies, before concentrating on other emerging markets.